The green flag dropped at Ohsweken Speedway Friday night as the 2007 season swung into action. 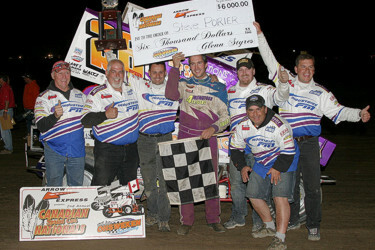 The Southern Ontario Sprints were the headlining attraction as the “Joyceville Jet” Rick Wilson found his way into victory lane. Rob Pietz turned in his best performance ever at Ohsweken in a sprint car as he run down the high flying Wilson in the closing laps to the cheers of the huge crowd but could not quite complete a pass on the high flying veteran. In a post race interview Wilson stated “I got hung up behind a couple of lapped cars and lost a lot of ground. I didn’t have enough gear in the car to run the bottom of the track but the car was good on the top. Rob must have been going good to get beside me but I could have pushed a bit harder if I had to. It has been a while since we have won here at Ohsweken and that feels pretty good. I race at a lot of different track but this one is the smoothest that I race on anywhere” concluded Wilson. For the second week in a row, pole sitter Craig Downie grabbed an early lead at the drop of the green from the 24 car starting field and set the early pace. Warren Mahoney, Kevin Job, Bob Crawford and Kyle Patrick lined up to chase the leader through the early stages of the twenty lap event. The first of four cautions waved on lap two as Keith Dempster lost the handle on the 5 at the exit of turn two. As the field took the green flag to restart the event the second caution flew as Glenn Styres in the Ohsweken Speedway team car to Dempster looped in the same spot in turn two. When the green flag reappeared, Downie continued to set the pace as Job, Mahoney, Patrick and Wilson gave chase. The five ran this way until the third caution of the event appeared as Joel Lehman came to a stop in turn two. Downie once again set the pace as the green reappeared on the speedway. Patrick and Wilson quickly moved around Job to claim second and third with Patrick overhauling Downie at the completion of lap seven. Wilson slipped by Downie on lap eight and Patrick continued to lead until entering the first turn on lap nine. The right front wheel left the 33k machine as Patrick was able to maintain control and limp to a stop in the exit road in turn two. With Wilson now the leader, the green flagged wave one last time. Job and Crawford moved around Downie on lap eleven as Pietz entered the top five. On lap fourteen, Pietz gained second spot and set sights on the leader Wilson. Downie began to show signs of mechanical problems as Dempster was closing in on the top five. Pietz was able to pull along side Wilson during the final laps but the determined Wilson held on to capture his second win of the season. Following Pietz were Job, Crawford, and Dempster completing the top five. Warren Mahoney finished sixth with Downie hanging on for seventh. Styres, Fred Cade, and Adam West rounded out the top ten. Heat races were won by Warren Mahoney, Kyle Patrick, Rick Wilson, and Bob Crawford. Jamie Collard captured the “B” Main. Next up on June 8th the series will return to Ohsweken Speedway Friday night before moving back to Brighton Speedway the following night, June 9th. Be sure to come out to a speedway near you as the series continues on it’s 2007 tour and for all of the latest news and information on the Southern Ontario Sprints be sure to log on to the official website at www.southernontariosprints.com.